Tips and thoughts; English A very useful rule of thumb when you start looking at reducing your packweight is to look at the three big ones. They being sleeping, carrying and shelter. It is not much use paring away at your tooth brush if your sleeping bag, backpack and tent weigh kilos more than necessary. So The Fjaderlatt Rule of Thumb is that if you ensure that these three big ones only weigh 3 kilos together (3 for 3 or 343, if you want to be cute) you have made a very good start. During one of our breaks in Vålådalen I asked the other bloggers how much their three big ones weighed and here are the results. By Jörgen Johansson. Joe Newton and his GG Gorilla pack. Backpack: Gossamer Gear Mariposa Plus Large weighing 680 grams. This was a first time for me with the Mariposa and I can compare it with my other packs of more or less the same weight; Golite Jam2 and ULA Ohm. My favourite is the Jam2, but it has the disadavantage of being on the small side if I carry a packraft and one week of food. That is why I bought the Ohm last summer and it turned out to be roomy enough for raft and paddles. The carbon fibre frame, lacking in the Jam2, also adds a bit of stability when you get to weights above 15 kilos or so. The Ohm was nice, but the Jam2 sits better on my back and I use it whenever I do not need the extra volume of the Ohm. The Ohm was for instance used in my winter trip through Sarek and did very well, being pulled in the Rulk most of the time. The Mariposa is about the same size as the Ohm, on paper any way, I got the impression that the Mariposa main compartment is slightly smaller. At least it feels shorter. I'll do some serious measuring when I have used it more and get around to writing a more thorough article on my impressions. Suffice to say is that the Mariposa worked reasonbly well for me during the Vålådalen trip, but I did not think that the compression system worked as well as it does on the Ohm, and particulary the Jam2. On the other hand the Mariposa has excellent mesh pockets along the whole side of the pack, which the other two packs do not have. Of course these pockets or the big mesh front pocket do get compromised when you need to compress. You cannot have one without the other and I am not so far 100% certain what I prefer. However, packing a paddle on each side of the pack, like with the Ohm when I am in packrafting mode, would be more difficult. Moving on to my sleeping gear I used a Western Mountaineering Ultralite Super at 885 grams. A three season down bag that teoretically was a bit overkill, since we had no frost nights, but still was surprisingly chilly due to the moist circumstances in my shelter. More about that later. For sleeping I used a closed cell pad for daytime use and insulation under my feet at night.This was a Multimat Adventure 1450 mm long and 8 mm thick. For softness and comfort at night I added my NeoAir short on top. I only fill it enough to keep my hip off the ground while sleeping on the side and this makes for excellent comfort and a minimal 'threshold' effect where it ends and the Multimat takes over. This combination weighs 130 grams plus 260 for the Neo; or a total of 1375 grams for my sleeping gear. Finally then, the shelter. This was part of my testing of the Terra Nova Laser Photon, which I used last season, but have been wanting to test with only the fly and no inner tent. An early or late hike with no bugs would be ideal for this, and the Vålådalen trip was perfect in this aspect. The fly including the short support struts at the end weighs 340 grams and to this the pole weighing 150 grams and pegs weighing 60 grams should be added. Since it was raining more or less all the time and there was no wind the door had to be shut and condensation was prodigous. This no doubt lowered the insulative properties of my down bag. 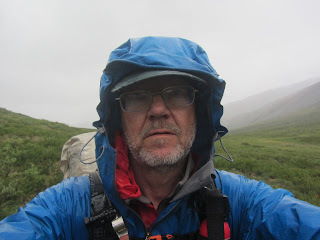 I would have been better of with a ventilating tarp, but on the other hand, a ventilating tarp might not have been comfortable had we decided to camp above timberline and run into nasty weather with high winds. Summing the shelters up, which is important in Nordic Lightpacking, I'd say we had three levels of shelters in the group. We had the tents, or almost tents, like the Hilleberg Rajd and the fly of the Laser Photon. 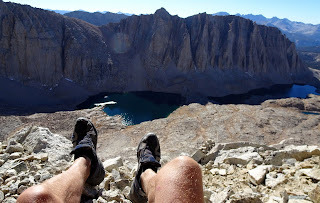 In my opinion these would have been the most comfortable in a situation with high winds and rain above timberline. The second group is the Duomid and Trail Star, which probably would have done fairly well in a situation with really poor weather above timberline. But they are a bit higher and have bigger surfaces of fabric to catch the wind and this might have made them more vulnerable. I have no firsthand experience of this though. A cheerful Hendrik under his minscule roof. The third group is the pure tarps, the SpinnTwind and the Gatewood Cape. Although the Cape can be tied down close to the ground all around, I had one break in a storm on Ireland a couple of years ago. In high winds and rain these might have been uncomfortable to spend the night in. They could of course be tied down close to the ground in such a situation and the bivies might have kept the sleeping gear reasonably dry. But this would have left very little room for anything but laying prone. It would have been less comfortable getting in an out of them, taking of rain gear without wetting the bedding or cooking. Now, this is of course academic since we could avoid being exposed above timberline by choosing protected camp sites and building fires to dry out wet gear and warming ourselves. And everyone was also very experienced, so rough weather would no doubt had been managed anyway, even if the margins of comfort would have been narrower for some shelters than others. My own shelter was very condensation prone and lowered the insulative capacity of my sleeping bag in these wet and still circumstances. However, I feel that the combination of low weight, actually the lowest weight of all the shelters if you count the bivies that most people used, and high storm worthiness that I deem the Laser Photon to have, made it very good allround solution. Total weight of my three big ones 2509 grams. A proud owner. Joe and his DuoMid. Let us compare this gear to the stuff used by my fellow travellers. They will no doubt decscribe the pros and cons themselves, so I will be brief and concentrate on the weight of the three big ones. Did everyone make it under 343? Hendrik used a Laufbursche Huckepack (334 g). For sleeping he used the Golite Ultra 20 quilt (535 g), the same Multimat as myself (130 g) together with a 6 segment Z-Lite (174 g) and the Laufbursche Bivy (210 g). His shelter was the Gossamer Gear SpinnTwinn (480 g). Total weight for Hendrik's three big ones: 1863 grams. Pretty good margin to 3 kilos I would say. Looking at Joe Newton's three big ones we find: A Gossamer Gear Gorilla pack (658 g), a Golite Ultra 20 Long (594 g), an MLD Soul Bivy (210 g), an MLD Duo Mid (720 g) and he should have been carrying a Neoair Small (260 g) but forgot it. So he made do with the foam in his pack and a borrowed piece of closed cell foam. So what Joe should have carried 2442 grams for this 3 big ones, but was in fact only carrying 2182 grams. Roger Brown used a modified Aarn Mountain Magic (1240 g) for carrying among other things a Nunatac Arc quilt (550 g), a Neoair Short (268 g), a BPL Vapor Bivy (282 g) and an MLD Trail Star shelter (529 g). Summing this up Roger's three big ones were 2869 g.
Gustav Boström had managed to squeeze a lot of light gear into his Gossamer Gear Murmur pack (224 g). His sleeping bag from MEC Merlin -3 (780 g), a SMD Gatewood Cape Shelter (350 g), an Equinox bivy (150 g), a GG Torsolite (100 g) and a Neoair Short (260 g). All this summing up to 1864 grams. So Hendrik and Gustav were the lightest of the lightpackers. Wet feet? No worries, mate. Martin and Gustav. Martin Nordesjö, last but not least/lightest, had the heaviest shelter, a Hilleberg Rajd 2 person shelter (965 g) that we will be testing this summer. This was fitted, most of the time, into his comfy Granite Gear Vapor pack (1090 g) together with his "extra extra long" Robert's Voyager Light down sleeping bag (800 g), an Exped Double Mat sleeping pad cut to 200 x 60 cm (210 g) combined with half a Z-lite borrowed from Hendrik (about 200 g), for softness. Total sum of the three big ones for Martin: a whopping 3265 grams. But of course, that was because he used a heavy 2-person shelter for test purposes. Comment in English below and in Swedish at Utsidan.se here. I have to say I found the article very interesting, there was a good variety of equipment used so I'll have to make a quick calculation and find out how close to '343' I am. It should be easier here in Northern Ireland as the mountains are smaller and the temperatures normally much higher but I feel I may be over the 3kg mark. In what way had Roger Brown modified the Aarns backpack? Thanks for all the info. Very interesting comparisons. I think I'm crippled by my Haglöfs synthetic bag at the moment, but one of those nice Laufbursche bags would be great when they come on the market. Yeah, the 343 is sort of a quick fix if you want to lower you pack weight where it really counts. Sort of tending to the camels before you focus on the gnats. My hiking experience of Ireland is limited, but I did some hiking in the Twelve Bens a long time ago. Exposure, wind and rain are probably comparable to the Nordic above timberline areas. Temperatures would not be that much different, except in winter. Main difference probably is that in Ireland you have a shorter distance to roads and houses should your shelter go completely to pot. The neat thing about 343 is that it is sort of a communicating vessel. If you prefer, or have a heavy synthetic bag (good in damp areas) you can still make 343 if you are extremely rigorous in your choice of pack and sleeping gear. Cool, I wasn't aware that Gustav was soo close =) By ONE gram! ANONYMOUS, Roger used smaller front pockets on the Aarn, which brought the actual size of the pack to somewhere near 35l to 40l? Roger surely will enlighten us soon. Great article, Jörgen, lovely photos as well! Another neat slackpacking trick is to scurry ahead of your friends, drop parts of your gear and let the others carry it until they catch up. "He who has the lightest pack when he dies, wins"
Hi Anonymous, thanks Hendrik, for your correct comments. The Aarn Mountain Magic 55 comes with a 37 litre rear sack and 2 by 9litre front pockets giving a total of 55 litres. I also have a Aarn Marathon Magic 33, which has 2 by 1.5 litre balance pockets. For the trip to Vålådalen I did not need 55l litres so I chose to use the smaller balance pockets of the Marathon Magic. giving me a volume of 40litres. This of course will not provide the same balance as when the correct pockets are used but I was still able to pack about 2 kg into the front pockets which helped to offset the weight (about 7 kg) in the main sac. This arrangement reduces the pack weight by about 300 grams. Whilst the Aarn pack is heavier than the other packs used on the trip, I find the comfort and load distribution ensures an enjoyable trip. I am considering to buy MM55. It will way as much as the golite Jam2 and my camera bag. The camera bag I usually carry in the front attached to the shoulder straps on the backpack. With the MM55 I will get the comfort of the bodypacks. I have actually been thinking of buying the MM33 as a daypack, when I don't need much volume. Very interesting, but Jorgen, could you please explain why having two mats, one being a bulky foam mat, combined at 390g is to be preferred to a single Neo air at 420g? Anyway, my inner gear junkie is stirring, watch out credit card! I always share with the missus. Your site is always interesting, even if my surroundings could not be more different,in Queensland the problem is always water, or the lack of it. I always felt that short inflatables are enough for me on this aspect. My hipbone and shoulders need padding underneath, thats it. So I oould do with a shorter NeoAir. Since the environment here is soggy, I want a more or less fullength closed cell pad for daytime use. There is a picture of a lunch break in the entry about the ligthweight course that illustrates this. This travels outside my pack, readily available. At night I inflate the Neoair and put it on top of the closed cell pad. The closed cell pad insulates under my lower body, and also protects from moisture (I need no ground sheet). I also feel that there is to little weight to be saved by cutting down on the closed cell pad or the Neoair for it to be worth it. I do not strive for the absolutely lightest gear; with a baseweigth of around 6 kilos for tundra conditions there is not much to do without compromising comfort. Nice piece and one I read with interest. One point that interests me: Don Ladigan (lighten up) suggests that when travelling in groups a good lightweight principle is to look beyond the individuals pack and to share gear over the group. I mostly travel with a group and we try, where possible to do this. For example one of a pair carrying the bulk of a two man shelter but then leaving burner, pots and pans for the other to carry. I think the principle can work very well, especially given that two and three man shelters can be, when averaged over the number of users, very weight efficient. In Valadalen the group carried five kitchens and shelters. I wonder if, as a group, you could have saved weight by combining resources? We could definetely have saved weight by sharing some stuff and that is to be recommended. Most common is probably to share shelter with somebody and you can get excellent two-person tents under 2 kilos. For our trip to Vålådalen I think the main reasons for not sharing was that we all had gear we wanted to test and also had in interest in the gear that the other guys were using. Yes, for a trip with family or friends (not this random collection of suspect internet acquaintances ;) ) i think sharing of equipment is really a central way to cut weight. That's why I do my best to report about the few shelters for more than one person. But as Jörgen says, this trip was a way to try and compare our personal gear. We could have taken three 2 person tarps and two BushBuddys and had a very low 'group' weight, a technique I would like to pursue on future trips. Oh, and internet 'weirdos' are sometimes very friendly, funny people! I've just given myself a nasty shock. My rigorous 343 weight is 2315g, including things like a Powerstretch balaclava for use with my MLD Quilt, a cut down insulating pad and a strictly unnecessary piece of polycryo under the MLD BugBivy. Add trekking poles at 380g for holding up the Cave 1 and I'm still under 3kg. This worked well for a fortnight in the Scottish midge season. So far, so good, but my all in weight with four days food from the shop in Cannich was more than 12 kilos. For me, 343 is just the start. I'll have to start using the dehydrator for a bit more than (delicious) banana chips. More discipline needed. Much more! But how can you tell in advance that 70g of sunscreen 65g too many?